This is my bug, it’s a ’69 VW Beetle, even though it looks rough, it’s in pretty good shape, the engine is in great shape, the body is in great shape, very little rust, it shifts good, we just replaced the tires, actually put military tires on the rear, these have a very aggressive tread, they will take just about any abuse/road I can throw at it. 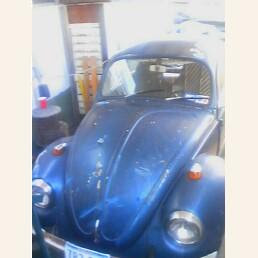 We plan on making it a Baja Bug, we will trim the fenders, add a different exhaust, paint it in camouflage colors (tan, green and black), I’m sure my husband has more plans for this bug, he had many of these when he was younger, and loves the bug. This car will take the abuse of the dirt roads in the mountains where I live, every one else’s cars out there are beat up, even newer cars & trucks are bounced to death in a year or so, my bug will not fall apart because of the roads, and anything that does need to be repaired, replaced or improved will cost much less and be much easier to do.